Celebrity Hairstyles: Halle takes the plunge! This is not my favorite Halle Berry hairstyle. Why? She’s a beautiful lady, but when you see what short hair can do for her face shape, longer length hair looks . . . dull. If you like this Halle Berry hairstyle, the subtle layering and soft side part will work with most face shapes. The only face shapes that I would caution against wearing it is oblong and rectangular shapes, for this style will tend to elongate them. Celebrity Hairstyles: How Short Will She Go? I’ve seen all kinds of short celebrity hairstyles lately, but this one is very unique. Halle Berry decided to add caramel highlights to her dark hair, and cut it into a bob. This bob has a lot of layering towards the bottom instead of a sleek style bob that other celebs are wearing, so hers stands out from the crowd. You can wear this hairstyle (or at least a version of it) if you have oval or square-faced features. On the other hand, you should avoid this haircut if your face is round, for it tends to make your face shape appear even more round. Instead I’d suggest a sleeker, not so round, version of this hairstyle to counteract the roundness in your cheeks. Wow, what a crop! Halle Berry has taken her celebrity hairstyles full circle since starting in the business. Remember the ultra short hairstyle she used to wear? This hairstyle is an updated, newer version of the old Halle Berry hairstyle. If you want a super short hairstyle like this one, you really need to have an oval face shape. Not many can pull this look off, and I’m not even sure I like it on Halle Berry. Women with petite, well-balanced features can wear these crop cuts. Avoid this style at all costs if you have a square jaw line or heart-shaped face; it just won’t be the most flattering short hairstyle option for you. I have to say that my favorite of these short celebrity hairstyles on Halle Berry has to be her short bob hairstyle. I think that with her ideal face shape she can pull off almost any hairstyle, but that one is her most flattering in my book! 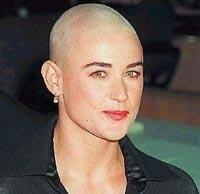 I’ll be on the lookout though for when (and if) she makes a Demi Moore move and shaves her head! Now for THAT look . . . you need the right head & face shape!! March 7, 2012 By: Paul Lynn Leave your comments (1), Your input matters. I thought Halle Berry was in such a caring relationship with views of a really long marriage. Looks as if there aren’t such things as blissful marriages like ours any longer – 20 years together and even now contented.